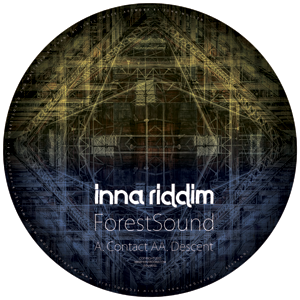 ForestSound is sojourning in sunny Portugal, but you wouldn’t guess it from the dark and broody sound of his latest release on Inna Riddim. If anything, he’s gone deeper into that subterranean vibe. Two contrasting takes on half-time drum&bass, both tracks are anchored by immense bass weight and a stripped-down aesthetic, but where ‘Contact’ has an off-kilter groove, surging forward with a squat and lumbering gait–a Triassic beast of a beat–‘Descent’ takes a hypnotic head-nodding route through a wash of sub with delicate percussive fills augmenting its rhythmic heartbeat. Heavy-duty biz for deep night dancefloors.